Two nuclear attacks have ever occurred throughout history, and both were bombs dropped by the U.S. to end World War II. While these weapons of mass destruction have been depicted as the ultimate world destroyers in fiction novels and movies, the apparent risk is not as high as it may seem at first. A nuclear attack does have a range of severity it could fall within- but all of them are pretty severe. Isolated nuclear attacks would be highly unlikely at this point, and an exchanged volley of nuclear warheads between nuclear powers holds the very severe result of nuclear winter. Yes. A nuclear winter is one of the more common and unpleasant SHTF/TEOTWAWKI events prepared for by preppers. A volley between superpowers with nuclear weapons would not only kill off ¼ of the world population in an instant, but severely damage the atmosphere of the earth as well. Although nuclear weapons are not produced at the same rate as they once were, there are still enough of them to end the world as we know it. The data points to only two occurrences separated from us by about 70 years. Nuclear anti-proliferation has been a priority of all nuclear superpowers. The way nuclear weapons have evolved into tactical strike weapons puts everyone at a lesser risk, unless you reside in a high population area, near a military installation, or in an industrial area. Prevalent winds also play a role in your risk of radiation exposure, since fallout can be just as deadly as the blast and can reach much further. There are several ways you could be prepping for a nuclear attack. Besides your catch-all survival kit and bug out bag, personal protection could be acquired and you could even invest in a fallout shelter. Preparing for a nuclear event requires a good amount of gear. While most of it is your generic survival gear that you will use for disasters and other events, there is some specialized gear that will come in handy. Be sure you have everything in order before the unlikely becomes reality. You may want to have a ‘get out of dodge’ bug out plan in your back pocket, depending on your location. I know most preppers, despite their wishes, do not own or have access to a bunker, but that is truly the ideal plan for a nuclear event. If you are far enough away from threat areas and not downwind from them, you may not need to prioritize a bug out plan specifically for a nuclear attack. Shield yourself from the blast. First, there is a shockwave which will blow out windows and knock over smaller objects and buildings. This shockwave is powerful enough to kill, so minimizing your exposure immediately should be your first priority. Depending on your proximity, the fireball or the blowback is next. The fireball is literally that- a ball of fire that consumes the impact point in a small radius. Much like a conventional bomb, there is not much hope if you are at the impact point of a nuclear weapon. The blowback is the original shockwave returning to the center of the blast point, which carries almost as much force as the original shockwave. Once you are shielded, if you have personal protective equipment (PPE), put it on immediately. Depending on the nuclear weapon’s proximity to the ground, radioactive debris will be kicked up into the air, also known as ‘fallout’. Detonations slightly above the ground produce the most fallout, and this can have the furthest reaching impact with permanent radiation contamination. Nuclear tests in the atmosphere, below ground, and underwater all have different effects but produce much less fallout. Atmosphere detonations are usually attempted to increase the range of the electromagnetic pulse produced by the explosions- which still occurs at ground level, just at a lesser range. 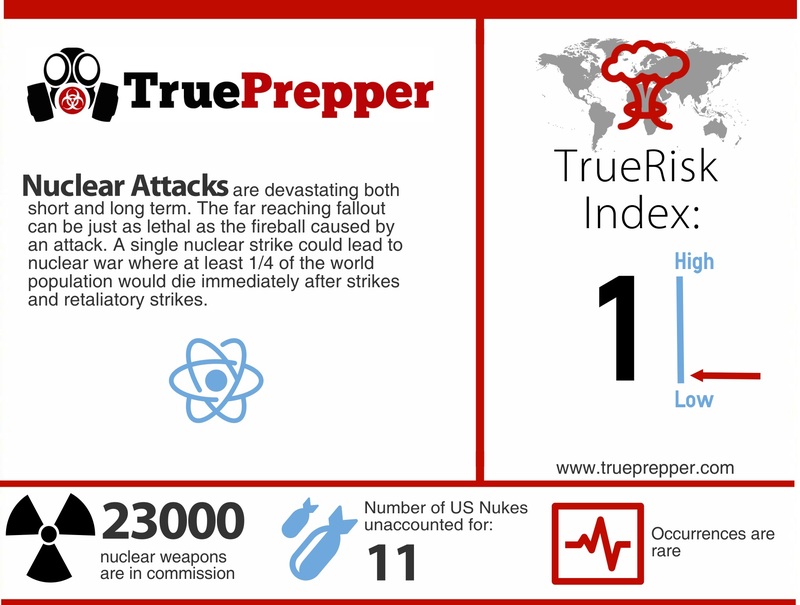 You can learn more about EMPs and how to prepare for this blast here: TrueRisk EMP. Entire series of movies, apocalyptic fiction, and video games are based on the after effects of a nuclear attack. Whether it is a single tactical nuclear strike, or a world-ending volley between superpowers, the immediate widespread invisible threat is the same: radiation. Staying shielded from radiation will be one of the most important parts of survival post nuclear strike. Radiation can contaminate the soil, wildlife, food storage, water, and of course people. Detection and protection are very important, and hopefully you had the foresight or luck to acquire both.